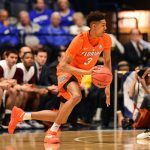 Florida Gators basketball improved to 4-0 with a thorough 78-61 defeat of the Belmont Bruins on Monday at the Amalie Arena in Tampa, Florida. 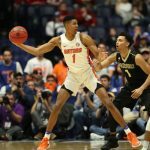 OnlyGators.com breaks down Monday’s win below. It was over when … Though the Gators already had the game well in hand, a 16-0 run early in the second half ensured that Florida would pull away for the victory. Graduate transfer guard Canyon Barry scored eight points on the run as the backcourt was responsible for 12 of the 13 points scored. That pushed UF’s lead up to 25 points, and even though it was outscored 27-19 over the final 11 minutes, the margin of victory was still comfortable. Barry finished with a game-high 17 points on 6-of-9 shooting. 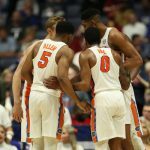 Exceptional efforts: Barry really was the bright spot for Florida on Monday, but the Gators did see sophomore G KeVaughn Allen and junior forward Devin Robinson each go 4-of-9 from the field to combine for 25 points and hit all six of their free throws. UF’s frontcourt was especially efficient with redshirt junior center John Egbunu pulling in 12 points on 4-of-4 shooting with a team-high eight boards and sophomore C Kevarrius Hayes posting seven points on 3-of-6 shooting with four rebounds. Significant stat: After a major dip in its free throw shooting, the Gators got back on track hitting 19-of-24 attempts from the charity stripe for a .792 clip. Considering Florida had a massive problem from beyond the arc (finishing 5-for-21 after 0-for-12), the efficiency at the line was especially important. What it means: After being overlooked in the new AP Top 25 college basketball rankings on Monday, the Gators went out and put forth another dominant performance, leading from wire-to-wire against what is considered a quality team. Florida also improved to 4-0 for the first time since the start of the 2012-13 campaign but accomplished this feat without playing a single game at home. Up next: UF will kick off the AdvoCare Invitational on Thursday at 8:30 p.m. when it takes on Seton Hall in Orlando. The game will air live nationally on ESPN2. Florida will then face Gonzaga or Quinnipiac on Friday before concluding the weekend with a third game on Sunday.